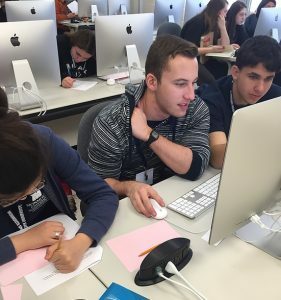 Participants work through a problem in the 2018 Monmouth University High School Programming Competition held in February. 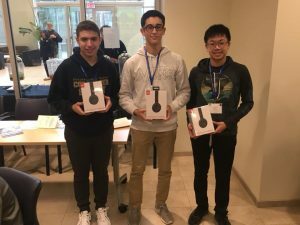 WEST LONG BRANCH, N.J. — (Feb. 28, 2018) — Monmouth University’s Department of Computer Science and Software Engineering (CSSE) hosted its annual High School Programming Competition on Friday, Feb. 23, 2018 at the university’s West Long Branch, N.J. campus. 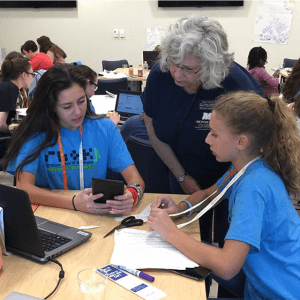 Seventy-two high school students from area schools joined their teachers and Monmouth University computer science, software engineering and information systems students for the day-long event. Participating schools included Freehold High School, Henry Hudson High School, Donovan Catholic, Middletown High School South, Ocean Township High School, Red Bank Regional High School, Toms River High School East, Toms River High School North, and Toms River High School South. Partnering with CSSE for the event this year were IBM, Commvault, and Sparta Systems. Monmouth alum Andrew Parise, who works for Sparta Systems gave the keynote address and John Walicki, IBM Developer Advocate, spoke about the IBM Watson Internet of Things (IoT) ecosystem. The Internet of Things is a network of physical devices, with embedded electronics, software, or sensors, which allow these objects to connect and exchange data via a network. Recent studies have estimated that more than 30 billion objects with a global market value of $7.1 trillion will make up the IoT by 2020. 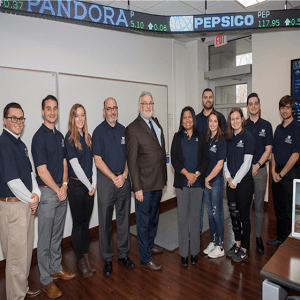 It’s important for the CSSE department and the university to continue to provide outreach opportunities to enhance the education of students in the region, said Jamie Kretsch, the CSSE department chair. Kretsch noted that while there are about 22,000 open computing jobs in New Jersey, colleges and universities in the state only yield approximately 1,100 computer science graduates each year. First place team Max Breslauer-Friedman, Adam Goldstein and Noah Lee from Freehold High School. Third place went to Arjun Sobti, Vineet Bhandari and Zackary Brown of Toms River North High School. “I think that if more students knew what it was like to work in computing, they would,” Kretsch said, pointing out that the average salary for a computing occupation in New Jersey is nearly double the state’s average fulltime annual salary. 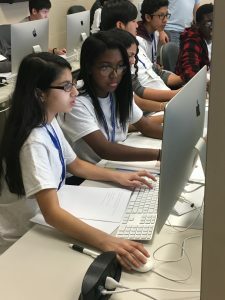 The High School Programming Competition is, “a fun, challenging, team-focused day and the CSSE department hopes it will inspire high school students to continue their computer science studies beyond high school. That’s a big step toward combating the shortage,” said Kretsch. 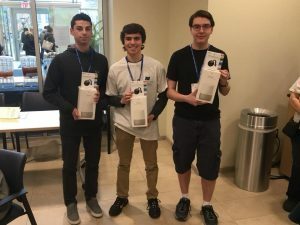 The team “Freehold1,” consisting of students Max Breslauer-Friedman, Adam Goldstein and Noah Lee, from Freehold High School took first place in the competition. Second place went to “Team String Foo” and students Adam Bloodgood, Harrison Darbin and Mike Nelli from Middletown High School South. 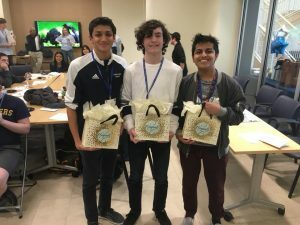 Toms River High School North’s “Team PolymorphiCS” and students Arjun Sobti, Vineet Bhandari and Zackary Brown took home third place. Industry sponsors IBM, Commvault and Sparta Systems provided prizes for the winning students and the Macaluso Group donated computing-related books for all teams. For more information on Computer Science and Software Engineering at Monmouth University, contact Jamie Kretsch at 732-571-4456 or jkretsch@monmouth.edu or visit https://www.monmouth.edu/csse.